Each patisserie in France has an interesting history. The original Baba cake was probably introduced to France from Poland by Marie Leszczynska’s patissier Stohrer, when she married Louis XV. Stohrer founded a famous patisserie in the Rue Montorgueil in Paris. 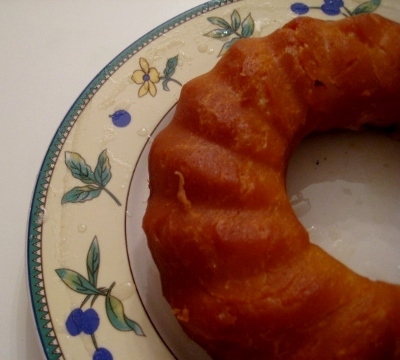 In 1835 one of Stohrer’s descendants soaked the Baba in rum and this world famous cake was created. Nowadays a sugar syrup is mixed with the rum. I found a bottle of spiced Mauritian Pink Pigeon rum in my drinks cabinet which inspired me to try making this cake. The raising process of my baking left a bit to be desired but the end result and the taste of the rum was spectacular. The texture and crust reminded me a lot of our local Koeksisters. Add 1 teaspoon sugar, salt and butter. Place dough evenly in mold, it should come up to half way up the mold. Pour syrup over cake when you remove cake from the oven. Serve in thick slices accompanied by whipped cream if desired. I liked it just by itself. I recommend pairing with a glass of Zonin Prosecco from the French Market shop. This Venetian bubbly is light and delicate and does not overpower the taste of the rum.